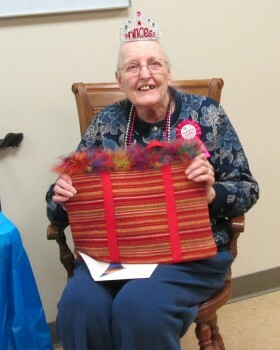 The North Webster Library staff recently surprised Myrna Hendersen with a surprise birthday party complete with cupcakes and gifts. Hendersen is a regular at the library where she enjoys working on puzzles, checking out books, and attending programs. NORTH WEBSTER — Get your kicks on Route 66 as Jay and Brenda Rigdon present a PowerPoint presentation of their trip driving the length of this historic highway at 5:30 p.m. Thursday, March 10. Established in 1926, Route 66 was one of the original highways in the U.S. Highway System. It ran 2,448 miles from Chicago to Santa Monica, Calif. and became known as the “Main Street of America.” Eventually it was replaced by the Interstate Highway System. The Rigdons followed its historic route last year and have put together a PowerPoint presentation of their trip that they will share. The public is invited to follow them on this iconic highway across America. Follow and stay connected with friends and family with Facebook. Learn how at the library’s Facebook Class at 1 p.m. Tuesday, March 8. You will learn how to set up a Facebook account and use this popular social networking website including posting messages and photos, sharing information, creating a friends list, privacy issues, and more. Facebook is a great way to communicate with friends and family as well as re-connecting with those you may have lost touch with over the years. The class is free and no pre-registration is needed. Craft and Chat at 1:30 p.m. Wednesday, March 9, is also a good place to social network. Bring your craft project to the library to work on and enjoy visiting with other crafters. It’s just an informal time of visiting and working on crafts. Kids enjoy crafts, too, along with listening to stories at the youth department’s weekly crafts and stories at 4 p.m. every Tuesday for grades K-5. At 1 p.m. Saturday, March 12, LEGO Club meets for free-style building fun for kids ages 5 to 12. LEGOs are provided. Visit the library’s Local History and Genealogy Center and take a trip down memory lane. The center has many local yearbooks including North Webster High School yearbooks dating back to the 1940s. You will even find a Purdue University Yearbook from 1911. Stop in and browse through our collection of school memorabilia.